Our guest house stands for its name: live there! Our comfortable guesthouse, renovated in 2016, is located between Tübingen (8 minutes by car) and Reutlingen (8 minutes by car). Stuttgart Airport can be reached in 20 minutes by car. In total we rent 5 rooms, of which 3 have their own bathroom and 2 rooms share a large bathroom. - Room 5 (about 10 m²): Single room, with possibility to use in a double room Bathroom shared with room 4. There are also two dining and recreation rooms, with their own toilet and a spacious kitchen. There is also a nice garden with a terrace where you can relax and have a barbecue. We really enjoyed our stay at the house - it's spacious, clean, and well-located. It's an old house with an interesting floor plan but very nicely restored. The hosts were very nice and helpful. Unfortunately, it rained both days so we couldn't use the nice patio. The kitchen is well-stocked and we were able to cook a nice dinner. We'd come back - and maybe bring some more people next time since it's a place with a lot of room(s). We rented the whole house for a week for our family of 10 to stay in for a family reunion and wedding in Tuebingen. Everything was as described, plenty of room for everyone and a nice area outside for barbecuing. Parking for four cars. Jettenburg is a quiet village without much shopping, but shops in Tuebingen and Reutlingen were close at hand, 10-15 minutes away by car. The owner was very responsive and interested in making it a great stay, including sending us a list of possible activities (with links) to activities we might enjoy in the area. The only improvements we would have liked to see would be a toaster and microwave in the kitchen, and fixing the door to the living room so that it can close if people are sleeping down there. 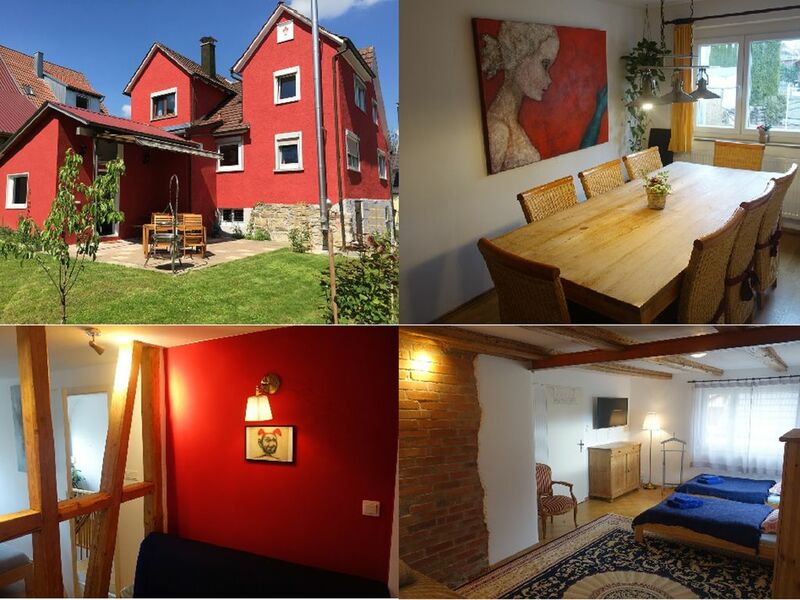 This is a great option for a large family wanting to stay in the lovely Tuebingen area. Thanks, Klemens and Bianca! Das alte Haus wurde mit viel Hingabe renoviert und ist liebevoll eingerichtet. Es hat mehrere Zimmer mit jeweils eigenem Bad. Somit war diese Unterkunft ideal für unseren 3-Generationen-Familienurlaub. Die meisten Schlafräume sind mit eigenem Bad ausgestattet. Das Haus und die Küche sind zweckmäßig ausgestattet. Leider ist der Esstisch für die maximale Belegung nicht ausgelegt. Der Aufenthaltsraum im Anbau ist leider bedingt durch die alten Fenster sehr zugig.